Creative types spend large amounts of time trying to dig into brands searching for the “authentic” essence and finding the exact image, quote, music, color palette or story that evokes a feeling that something is real. We see and hear the word authentic attached to “experience”, “taste” and even “replica”. Our perception that something is or isn’t authentic can evoke an emotional or even visceral response for good or bad. It can make us angry, sad, happy, reflective or even get us to buy something. In a world of clickbait, it seems like a paradox that some subset of the very folks that bombard us with messages to influence our purchasing behavior by any means necessary, would preach authenticity. We use our perception of what is real and true to help us sort through the overwhelming load of information we deal with every day. It is a great tool. I was watching a segment about Donald Trump quoting scripture while at Liberty University last night. My reaction was based on my impression that his inability to properly quote scripture and his excessively profuse praise of The Bible as being the only book better than his own; “The Art of the Deal”, evoked a visceral response. To me it was a straight up demonstration of pandering to an audience without regard for the audience. It certainly didn’t help his cause with me, and probably not anyone else. A few weeks before, there was a debate among commentators as to whether or not President Obama’s tears when talking about child victims of mass shootings were authentic. So perhaps authenticity isn’t about being true or being false it is about the perception of being real. Think about how we use the term “authentication” today. When computers connect our passwords and security software “authenticate” that it is really us. If a document is “authenticated” that doesn’t mean it is true or false, it just means it is what it claims to be. 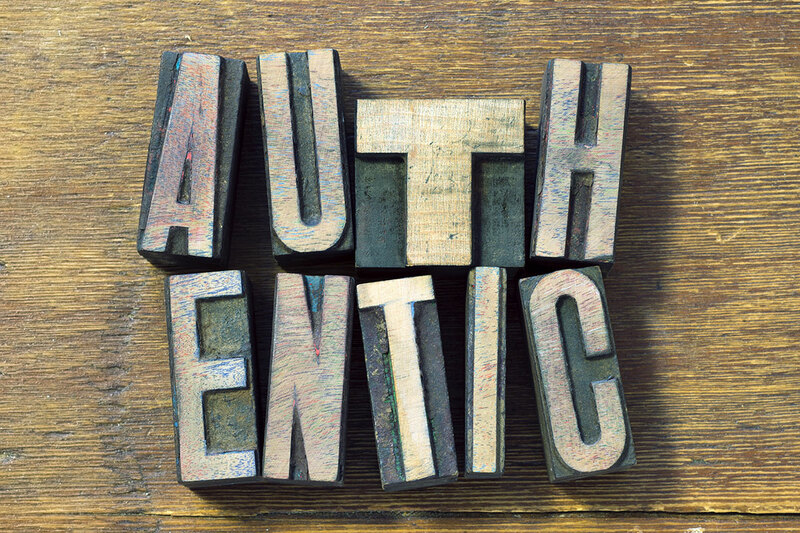 In the marketing world, authenticity has fallen victim to overuse as a selling style, rather than as a value. Let’s face the fact that some marketers have to create an authentic seeming veneer, because if we knew the reality was simply to meet the 4th quarter sales goal they wouldn’t have any story to tell. And sadly even if something is authentic, it may not be perceived such. But every now and then we see an image or hear a phrase that we know is authentic. Not because it was crafted, but because it came forth spontaneously, unvarnished, raw and true. When that happens no one needs to attach the word. We just know.